200 cards (including the checklist card) and five hologram chase cards. 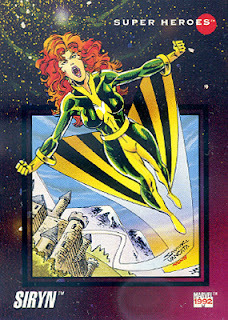 The background on the front of each card is a star field, with a varying geometric shape set between the background and the central image of the character. 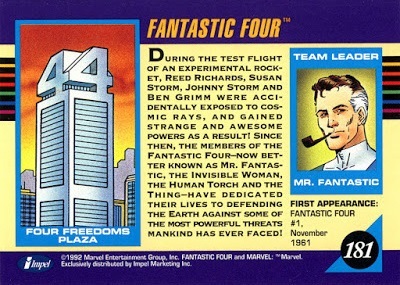 The card backs are landscaped, with a headshot of the character along with a quote and the series, issue number and date from which the quote is taken on the left of the card. Beneath that is the character's real name, group affiliation, and first appearance. To the right of the headshot is bar graph mapping each character's aptitude in strength, intelligence, energy projection, mental powers, fighting ability and speed. Beneath that is the character's biographically information. 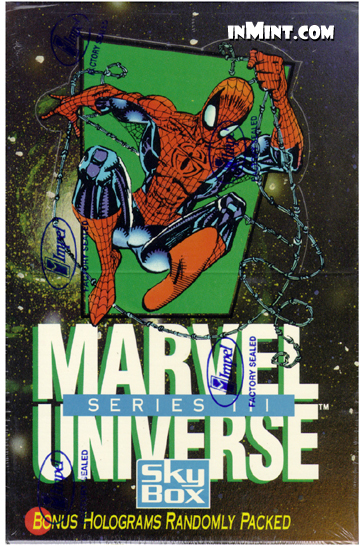 Released in 1992, this series came 12 cards to a pack (as with previous releases) and features art from, amongst others, Ron Lim, Marc Silvestri, John Romita Jr., Mark Texeira, and Sam Keith. This is the first 200 card set (the previous two were 162). Series IV will go down slightly to 180, while Series V will go back to 200. While there's the usual super hero/super-villain subsets, in this series, those two groups are split-up by a "Team-Ups" subset, notable for featuring not only hero team-ups but villain team-ups (like Black Tom & Juggernaut). The back of each Team-Up card lists the characters' first team-up (or, sometimes, "encounter" instead of "team-up"), and the write-up varies from discussing the two characters' relationship in general to details on a more specific encounter. Not surprisingly, there are lot of Wolverine (6) and Spider-Man (7) team-ups in the group (out of 30 team-up cards). 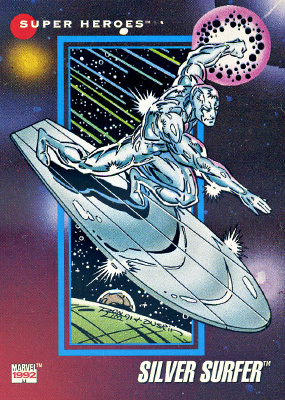 In addition to heroes and villains, there's a "Cosmic Beings" subset as well, highlighting characters like Galactus, the Living Tribunal, and Death. 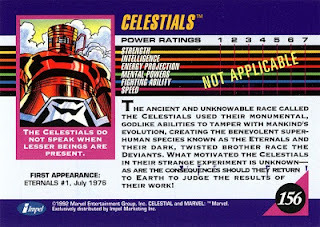 The Celestials' power rankings are stamped "not applicable". 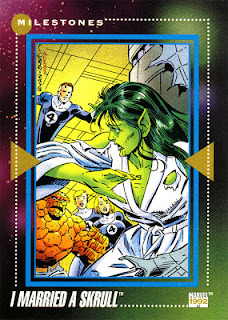 Notable changes in the standard Teams category: the larger, Alan Davis-fied Excalibur is represented, the Serpent Society is the sole villain team represented, the Nightstalkers, a then-recent group dusting off some of Marvel's 70s-era horror characters gets a card, as does the revamped Guardians of the Galaxy (a team that debuted in the 70s but got a 90s retooling around this time), and like the Avengers, the X-Men get two team cards, one for the Blue team and one for the Gold team. In a break from previous Teams subsets, these cards don't always list the individual members of every team pictured on the front, and if they do, the members are worked into the description of the team on the back, rather than broken out separately, something that always bugged me as a kid (when these card sets were one of my chief avenues for learning more about the wider Marvel universe). Instead of Famous Battles or Arch-Enemies, this set has a subset called "Wars", though it covers some of the same ground as those previous subsets, while adding more recent events like "Operation: Galactic Storm" to the mix. As with previous sets, the "Atlantis Attacks" and "Evolutionary War" cards make those stories sound far more interesting and cohesive than they actually were. Two other new subsets: "Origins", which details the origins of Marvel's most enduring characters (and Ghost Rider), and "Milestones", which details such classic moments as "The Dark Phoenix Saga" and the death of Gwen Stacy, as well as that time Tom DeFalco revealed that the Alicia Masters that married Human Torch was a Skrull. Thanks again to Will Paredes' website for the card scans. 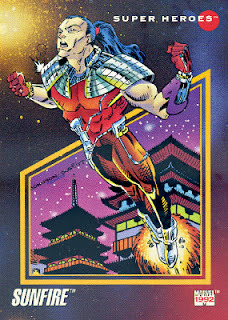 Pantheon (which has actually been around since 1990), Slapstick (this year's "new character given his own series" a la Darkhawk and Sleepwalker in series II), Cerise, Darkhold Redeemers (who may not have even appeared in a series together at this point, so they're an uber rookie), Strong Guy (whose profile had certainly been raised in the last year, but has been around since the 80s), Bishop, Silhouette (who, like the Pantheon, has been around since 1990), Kylun, and Guardians of the Galaxy member Talon. 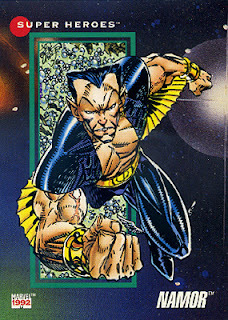 Even Sunfire, not technically a member of the team, gets his own card (presumably on the strength of his appearance in Uncanny X-Men #284-286), featuring his terrible new costume. As with the Jim Lee X-Men set, Omega Red and Shiva get cards even though they've both only appeared in one story at this point. Necrom, on the strength of one Excalibur story, earns his own card. Cyber, with two stories under his belt (counting the X-Factor story that certainly hadn't been released when these cards were designed) also gets a card, contributing to my early belief that he was a bigger, more established character than he really was. 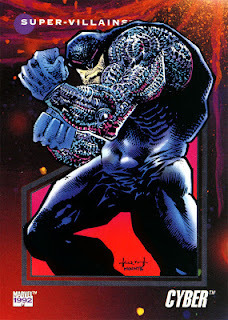 Apocalypse also gets a card, even though he hasn't appeared since X-Factor #68, though with his return in "X-Cutioner's Song" on the horizon, that makes some sense. White Queen also gets a card, despite being functionally dead since Uncanny X-Men #281 and her pre-Generation X return still a couple years off. Domino's biographical info makes no mention of the "she's an imposter!" storyline that's unfolding in X-Force. 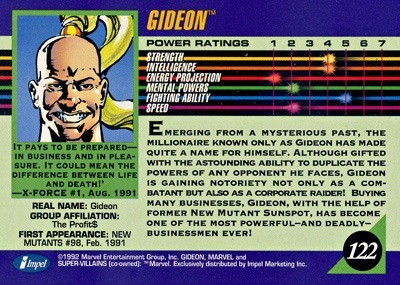 Similarly, Gideon is once again said to be a member of a still-unseen or mentioned group called "Profit$", and no mention is made on his card of the Externals. Guido's townhouse is listed as X-Factor's headquarters. "Hearts of Darkness" gets highlighted thanks to a Wolverine/Punisher/Ghost Rider Team-Ups card, as does the X-Force/Wolverine team-up from New Mutants #93-94. 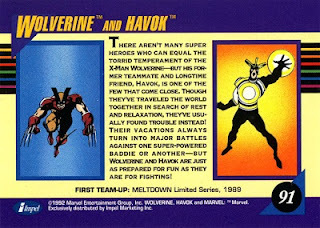 Humorously, Havok and Wolverine get a team-up card centered on "Meltdown", even though the two were, you know, teammates, long before that story. Lots of 90s-riffic characters in this set, including Sleepwalker, Darkhawk, the new(er) Deathlok, Nomad and Cage in their new looks, and cards for members of the New Warriors and the new Guardians of the Galaxy. Zarkko the Tomorrow Man, an old Thor villain, gets a card, presumably because of his return in a then-recent DeFalco Thor story. 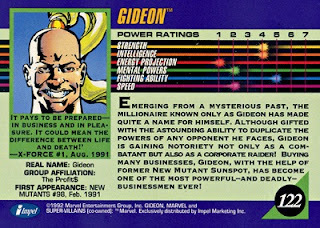 Several Ghost Rider villains that haven't exactly stood the test of time (like Blackheart) have their own cards as well. There's also a lot of cards for older characters poised to make a comeback in the early 90s, from Ant-Man (who debuted in the late 70s but is poised to be featured regularly in Fantastic Four) to Morbius (who debuted in the 60s but is a fixture of the "Midnight Sons" franchise), to Dracula himself. The Collector appears in the Cosmic Beings subset featuring his updated look from the "Collection Obsession" Avengers storyling in 1991. 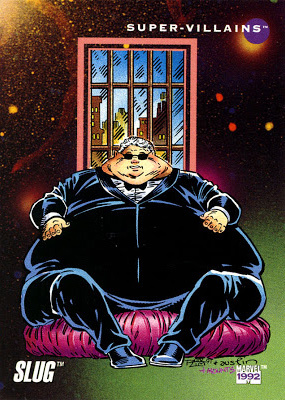 Obese-crime-boss-who's-not-Kingpin Slug gets his own card in this set, another character I erroneously believed to be a much bigger part of the Marvel universe than he really is thanks to said inclusion. Mr. 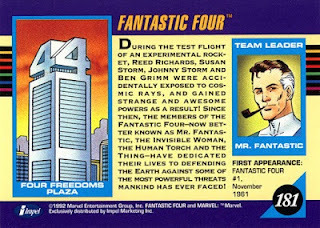 Fantastic is smoking a pipe in his headshots. One of the more iconic cards in this set (it part because it showed up in all the ads and on the box/pack art), I also like the way the city is framed in the background rectangle. Another iconic image from this set; good sense of movement, aided by the lines inside the box. 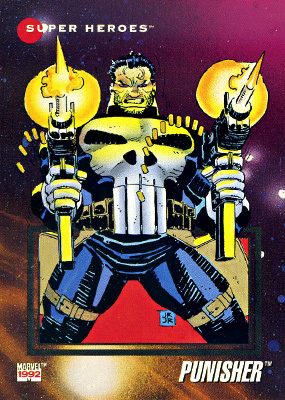 I just really like Romita Jr.'s Punisher. Really like the way Moo Knight's cape covers/is part of the background circle (most of my favorite cards in this set are the ones that cleverly use the otherwise-annoying background shape well). Pretty sure this is Erik Larsen. The shift in perspective makes for a bolder image than most (there's a Nova card like this too, but that one takes the perspective shift almost too far). Another interesting perspective. Putting her teammates in the background circle gives her a "busting out" energy. Enjoy the movement and energy in this one. I can' tell who drew this one for sure, but it almost looks like Howard Chaykin. At any rate, I like that the characters are just busting out of the star field through the card, and the juxtaposition of the gun/shield. 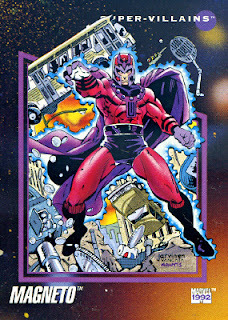 Magneto just seems to lend himself to iconic images well. 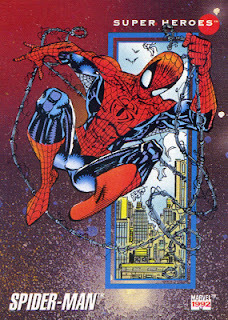 I know next to nothing about Cardiac other than that he's a fairly maligned, 90s-riffic Spider-Man villain, but I like the top down perspective of this, the way his pole weapon thingy seems to be coming out of the card, and the energy effect around his other hand. Like Magneto, Sabretooth seems to take to iconic images well. And, of course, this is Marc Silvestri, which helps (not also, it's Sabretooth's original costume and not his Lee-designed one. And also, the disappearing feet). 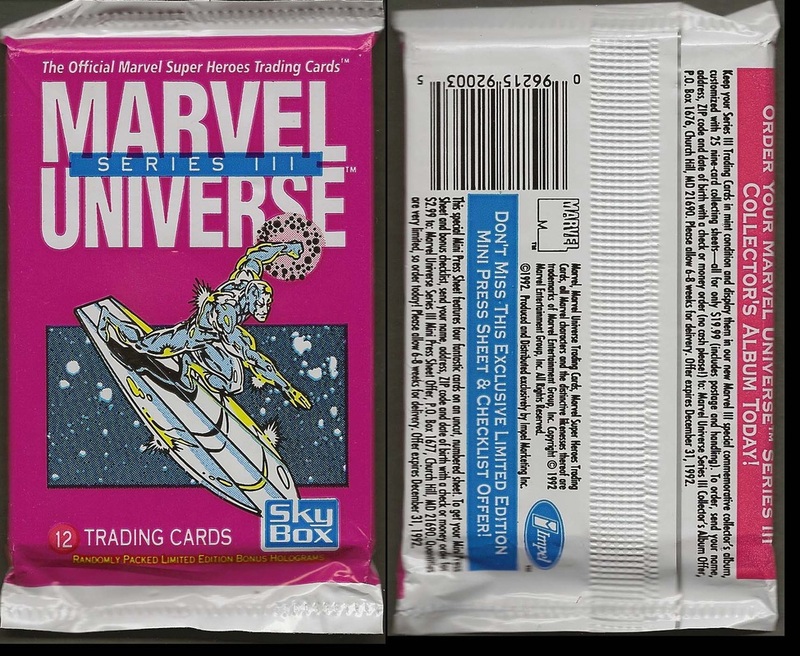 This is the last truly classic set of straightforward Marvel Universe cards, as the next two series suffers from a serious design flaw (and have to grapple with increasing market dilution). This is also the first series of cards that I don't love unconditionally, as the basic design is messy and cluttered, distracting from the central image of the card (which is more often than not diminished in size and lacking impact as a result). The decision to flip the layout of the back of the cards, from portrait to landscape, is also deeply annoying, requiring each card (or the entirety of your card binder) to be turned in order to read the information on the back. This series also suffers from an apparent drop in quality of available artists (which is true of Marvel in general at the time). Ron Lim, for example, seems to have drawn a lot of the cards, and while Lim is a perfectly cromulent artist, he's no Art Adams or Jim Lee, especially when it comes to the kind of pin-up-esque images that these cards essentially are. There are still plenty of standout cards, but in general, the artwork is more workmanlike and less immediately impressive than in previous sets. All that said, there's still some charm to this set. Part of it comes from the increased card count. 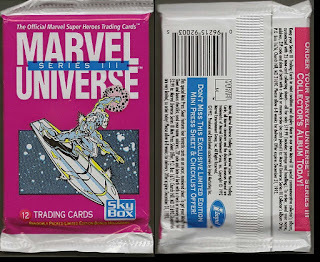 Expanding to 200 cards (and not padding that number with a subsection of cards akin to the jokey Spider-Man interview cards in Series I) allows the set to cover a wider swath of characters, pulling characters (and team-ups and "wars") from a larger chunk of Marvel's history. 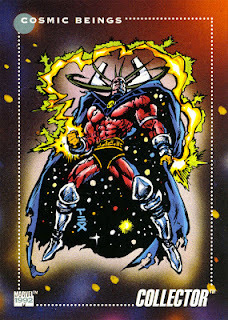 The inclusion of Marvel's various cosmic characters in their own subset (made possible by the increased card count) helps create a sense of the scope of the Marvel Universe (in many cases, those cards represent my first encounters with many of those characters), while the "Origins" and "Milestones" subset, obviously, speaks most directly to Marvel's history, at least of its most popular characters and most notable events (and Ghost Rider & Lyja). This set is also very much of its time, a window into the early days of Marvel's 90s boom era expansion, when they were throwing title after title onto the stands in an effort to glut the market with as many books as possible. 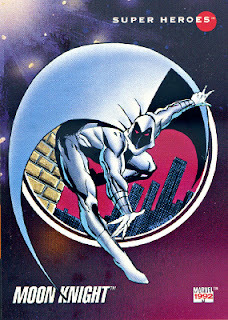 But many of those "new" titles were drawn from Marvel's past in one way or another: a new Deathlok, a new Guardians of the Galaxy, a revampe of Blaxploitation icon Luke Cage, the popularity of Ghost Rider leading to a revival of horror characters like Morbius and Dracula, even the Adam Warlock/"Infinity __" stories that are all over the early 90s have their roots in Jim Starlin's 70s era cosmic stories. The end result is, somewhat paradoxically, a series of cards that is both a relic of a particular time in the early 90s, but also, a surprising survey of the history and breadth of the Marvel Universe as a whole. Next week, Professor X deals with the fallout of "Operation: Galactic Storm" in Avengers #350-351, Spider-Man meets Phoenix in Spider-Man #25, and Wolverine gets a haircut in Wolverine #59. If I'm not mistaken, all the main cast were new characters premiering in DARKHOLD #1 and hadn't appeared anywhere at all (the Montesi name had a history though). The supporting character Mordred the Mystic obviously had previous appearances. I never realized that the 70's revival was so huge feature of the comics 90's. 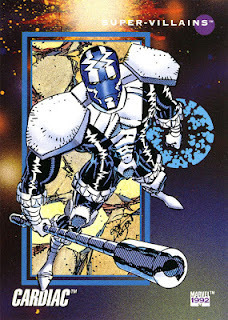 Of course you (get to) know individually that Warlock or Deathlok or the various vampire characters or Ghost Rider etc. draw on an impressive history, but when you put it like this it equals to mind=blown. It becomes scary to think that maybe the 90's early vigor happened only on the strength of those great 70's concepts, and the hit to the wall was caused by the realization that the new stuff the 90's tried to add on that was for a large part horribad. Overt cybernetics and one-note Silver Age throwback villains and the very by-the-numbers approach of clicheic superhero book making ("let's fight these comic book villains in this month's issue") on concepts that don't so much bend for it. The 70's era characters showing up in the early 90's is because the writers/artists at that time grew up on those characters and wanted to write them. You see that with every era of comics now where people pull what they enjoyed as kids, same with Bendis and Spider-Woman and Cage. This card set is third for my favorite of the five, with #2 being my favorite and #1 being my second favorite. I was walking in hte grocery store with my mom when there was a stand of boxes of these Series III, I bought it for something like 20 or 25 for the full box. The Holograms from this set were strange because they had different colors for each and it made it harder to see the actual image. I remember paying more for X-Men 2 box when it came out and Marvel Masterpieces was something like 1.50 or 2.00 a pack, it was the same or more than comics at the time and short printed. I remember trying to get a box and not being able to afford it and having to piece it together by trading and random packs here and there. 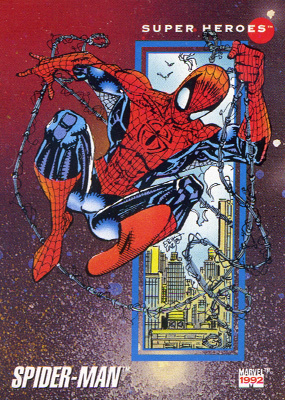 Thanks to the house ads of that era, whenever I see an image of that Spider-Man card, I expect to see a bunch of tweens completely slack-jawed, slapping themselves on the face in awe and wonder at the sight of that giant card. Also I passionately hate Eric Larsen's art. I can’t take this much ’90s. Not sure I’ve even heard of Slug or Cardiac before now, and I’m fine with that. Yeah, Namor has to be Larsen. 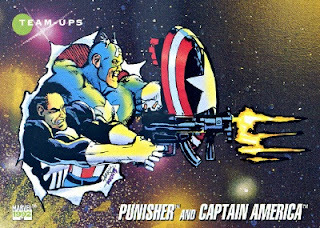 The Punisher & Captain America card looks to be signed “Harris/Mounts” — Mounts being colorist Paul Mounts, I assume, but don’t know which Harris that is. Ron Harris, maybe? Cap in particular looks like a parody of himself. Unintentional or not here, it certainly can't be an accident that off-panel Black Tom Cassidy is invariably referred as "Juggernaut's partner". As Claremont is concerned, I can't find it in my heart to grant him plausible deniability on this one. This set was really good for cutting out multiples and making 3-D image cards. I had friends that would do that in school with these and sell them. Nova is a good example of a card that really explodes off of the card with a 3-D image. 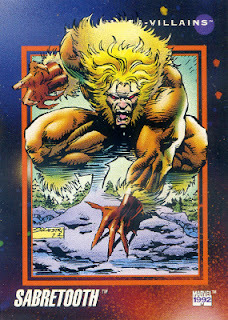 Sunfire and Feral are both other examples shown of cards that looked good in 3-D. I remember seeing that very thing on display and for sale at a fair in San Diego long, long ago. Wonder if it was them? Probably the last really strong set marvel does, in my opinion. I have major fondness for this series because Marvel produced two posters featuring the entire set on them. Basically they looked like uncut card sheets, but on poster paper. My mom gave me the posters one year for Christmas and they hung on my wall pretty much all through middle school and most of high school. "Several Ghost Rider villains that haven't exactly stood the test of time (like Blackheart) have their own cards as well." 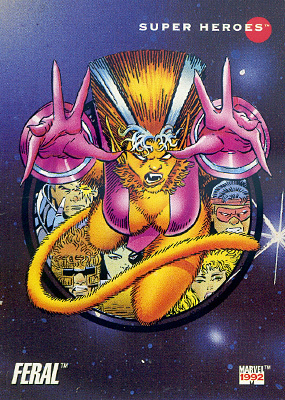 I always thought Blackheart was a major character due to his appearance in Capcom's Marvel arcade games. Same with Shuma-Gorath! It was a few years of never seeing either in a single comic before I realized they weren't.